Hi everyone I'm Jack Red, it's time to talk about the villains of Batman. Not many of them are on both Batman shows. Thankfully most Batman fans should easily know the following very well. This is going to be a crazy blog especially for Batman fans. Honestly I couldn't be any happier to be writing this. Warning this will be a lengthy blog entry. Please take as many breaks as possible. We really don't want you to go to a hospital over night. I do want to make a few things clear before we start kicking things off. I am saving The Joker for his own part of this huge comparison. I won't do The Mad Hatter since he was Hatman aka Impostor Mad Hatter. Therefore comparing a different character to the actual one with no real connection is against the rules. Trust me this wouldn't be a good showdown even if I did it. This is a rather tricky one to talk about. Three different actors portrays Mr. Freeze on the show. The original one appeared normal in his suit. Clearly lacking his frozen blue skin that we all expected. He works by himself trying to defeat Batman. They chose to not have him doing it to save his wife. Let's be honest Mr. Freeze is willing to do whatever he can to save her. Simply not having that there does help Gotham's version out. Originally he started off like that until he fell his wife was going to die. He committed suicide with his freezing gun. Due to Dr. Strange's strange experiments that revive several people & altering them. In Mr. Freeze's case, he got the condition you expect from him. Sadly he chose to work for The Penguin that hasn't been active recently. I felt all three actors in 1966 version sorta come off as different characters with not much bring them together. In a weird way it was like the Three Stooges attempting to be Mr. Freeze lol. In Gotham, I felt this was a more faithful version. Clearly after being revived, he became as cold as he is in the comics. I do enjoy these episodes but let's be direct. It is frustrating to remember which actor did which episode of Batman 1966. To me he wasn't the right level of seriousness, he never did it to save his wife and wanted stuff he would never want. Honestly after much needed thought I must give this to Gotham's Mr. Freeze. His appearance as the character blew me away. Regardless him alive prior to his suicide or after being revived. This version was way more on point with the comics. If you are a fan of Mr. Freeze then go watch Gotham. Also the way he does stuff is exactly how the character would do it. WOW can I be honest? Both shows portrayals of The Riddler blew my mind. They're so damn good in so many ways. Anyone whose a Riddler fan would enjoy a marathon with episodes. In 1966 version, he already is The Riddler that does have clever clues within riddles to his plans. Yes some of these are meant as jokes for the time but still a lot of thought for a show like this. I like in Gotham, we get to learn a great deal about Edward. What he did before becoming The Riddler. Both shows has some great riddles for their time. Two very interesting takes on a very complex character. Two amazing actors that truly belong near the top for The Riddler. Yes I do like Jim Carrey's portrayal as well sue me. Obviously we're comparing a much lighter Riddler to a darker one almost like two sides of the same coin. In 1966 show & movie, The Riddler is constantly throwing out riddles. He does attempt to fight Batman and Robin. In Gotham, Edward does go insane becoming The Riddler. You wouldn't believe some of the stuff he does to people. Honestly I am really having a hard time deciding which version of The Riddler more. On one hand, due to a disagreement the guy who originally played Gomez Addams on The Addams Family briefly took over the role. Also over this a few episodes like False Face and Book Work happened. The Riddler has teamed up with several of Batman's enemies. More recently on Gotham, Solomon Grundy has been helping Edward out. He helped one of Gordon's exes take over a fight club. Both versions has their own pros and cons. So the real riddle would be whose truly worthy the title the one true Riddler? After much needed thought I have decided to go with out 1966 version. Despite a different actor not doing a good job as The Riddler and some episodes that got altered over a disagreement. Frank Gorshin truly steals the show with some strong personalities. I strongly felt even Gotham's Riddler isn't good enough to top him. I will say he does come very close. I really do want to see more of him in the near future. WOW just like The Riddler, both actors as The Penguin are very good at portraying him. Two truly worthy of Danny DeVito's take in Batman Returns aka my favorite version of the character. At one point both of them were mayor of Gotham City until something happened. Both are skilled at deception & thinking of ways of stopping the authorities in their tracks. I got to be honest you could marathon episodes of their shows all day. They're portrayals of the characters are very excellent in their own right. In 1966 version does look more like the character while how he actually does thing is in Gotham. The Penguin may be given a mixed character due to how he was adapted over the years. Right away two of your favorite characters will be them. I knew it as soon as I seen them both. In 1966 show & movie, The Penguin has teamed up with some villains to fight Batman and Robin. In Gotham, it shows how he rise to the top. Of course all kind of problems hits his way. 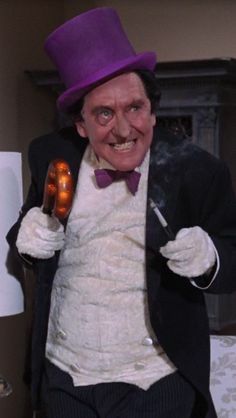 The Penguin did truly terrible stuff to people you really wouldn't believe. I got to be honest unlike the last two I covered. I don't have much to decide which Penguin is better. Let's be more direct DC comics is very proud with both actors. Simply choosing one over the other without a good enough reason won't cut it. In fact this very easily could end in a tie for many reasons. Both versions isn't afraid to do such under hand tricks. Honestly on one hand with 1966 version does look more like the character. But on the other hand Gotham's version has an unique way of throwing people off. There is just something about him that quickly makes watching him worth every minute. In one episode of Batman 1966 he attempts robbing pretending to make a movie. I felt this easily could go to either character. I really don't think in this rare occasion I could pick one over the other. I already know if I did, I would question myself over it. Therefore I decided to make this a tie. Both of them has things the other doesn't have but both actors really do an amazing job. Some of the craziest episodes of both shows centers around these two.